Note: To read earlier chapters, click on the desired title in the “Chapters” list in the right sidebar or at the bottom of this chapter. Recreating a sense of the past involves many things: memory, family stories and records as well as much original source material as one can find. This chapter pulls together the things that for me capture the reality of life for my Zimmermann and Willems family when they were settling into the land just west of Waldheim, Saskatchewan in the early years of the twentieth century. The pulpit in the photos above[i] was made by my great-grandfather Heinrich H. Zimmermann. He built it for the Brotherfield Mennonite Brethren Church, which is about seven miles west of the town Waldheim, Saskatchewan. My aunts Mary Davis and Rosella Noble told me that their Grandpa Zimmermann was a carpenter and that he made beautiful cupboards in people’s houses when he lived in Reedley. They also said he painted flowers on the cupboards, and there are flowers painted on the top of pulpit. These photos confirm that Heinrich Zimmermann was not just a carpenter; he was a skilled cabinet maker. The pulpit looks very much like some of the painted furniture in the book, Mennonite Furniture: A Migrant Tradition (1766-1910). 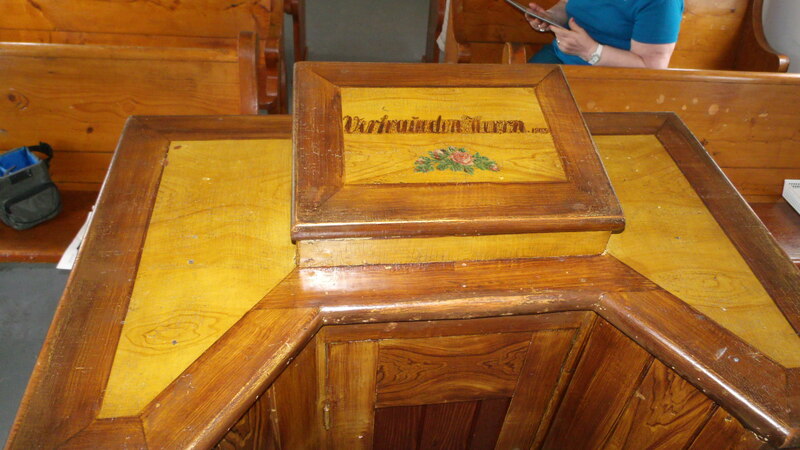 [ii] The author of the book, art historian Reinhild Kauenhoven Janzen, states that Mennonites used three different types of painting on their furniture: “(1) solid colors, (2) graining in imitation of hardwoods, (3) graining with floral decorations.” Heinrich’s pulpit seems to fall in the third category: “graining with floral decorations.” I can’t tell for sure since I have not seen the actual pulpit, but in a large blow-up the graining on the front and side of the pulpit looks painted, very skillfully painted. Also painted on the top of the pulpit is the date 1903, which is most likely the date of its construction, which was the year the Zimmermanns arrived in Canada. 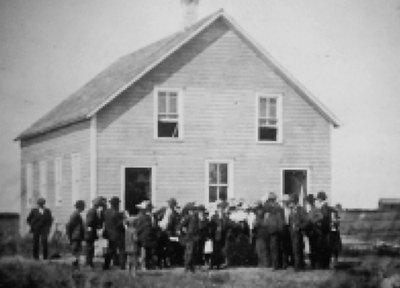 The place where they lived was Winkler, Manitoba, not Waldheim, Saskatchewan, but there were only two Mennonite Brethren churches in Canada at that time, and there was frequent contact between them. The Brotherfield MB church was built during the summer of 1902, the summer before the Zimmermann family arrived in Winkler. 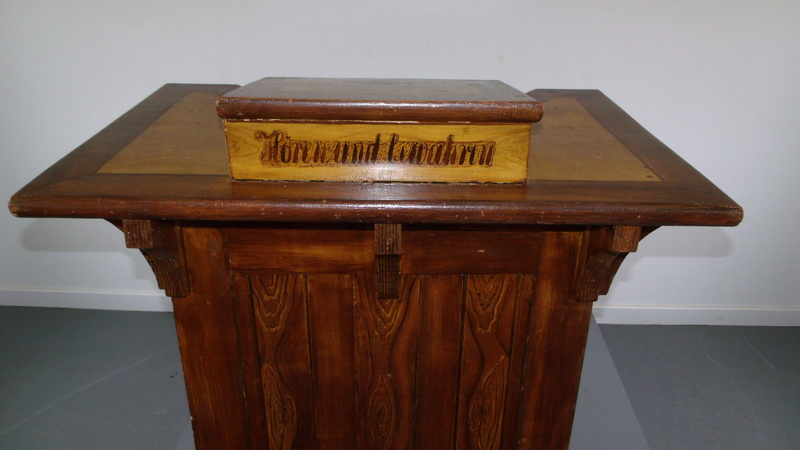 When the people in the Brotherfield church heard that a cabinet maker had arrived from Russia, they likely decided to commission a pulpit from him. The finished pulpit could have easily been shipped by train. The suggestion for that commission may well have come at the urging of David Dyck, the pastor of the Winkler church mentioned in my great-grandfather Heinrich Zimmermann’s 1905 letter to the Zionsbote, the Mennonite Brethren newspaper. David Dyck was not just the pastor of the Winkler church. He was an Elder. Mennonite churches at that time had three ordained ministries: Prediger (preacher), Lehrer (teacher) and Altester (Elder). All of these positions were filled by men called from within the congregations, men respected for spiritual insight, upright life and leadership ability. Ordination was for life and included no salary. Lehrer were ordained to teach, Prediger ordained to preach. The other functions of the church: baptism, administration of the Lord’s Supper, and the ordination of preachers and elders were reserved for those who had been ordained as “Elder” (Altester). Elders served a whole district and not just their home church, a responsibility requiring regular travel throughout the district. [iii] As an Elder, David Dyck would have been concerned about the financial situation of the newly arrived Zimmermann family. He very likely saw the new church building in Waldheim as an opportunity to give Heinrich employment. Family lore says that the marriage between my great-grandfather Heinrich Zimmerman and great-grandmother Elisabeth Bold Willems was arranged by the church. David Dyck with his regular trips[v] between Winkler and Waldheim and his active concern for the material and spiritual welfare of his flock was very likely the individual who acted as match-maker. Arranging a marriage between a widow and new widower would have felt like Christian service to the people in the Mennonite Brethren churches, a way of taking care of two families for whom the churches felt concerned. Heinrich and Elisabeth almost certainly saw the match-making in that same light—as God’s hand working through the church to meet their need. Both of them were lonely; both had children they were trying to parent alone. Elisabeth had a farm, and Heinrich, who wasn’t yet settled in the new country, was free to pick-up and move to her farm. In August of 2013, I received an email from a distant cousin, Keith Kroeker, a member of the extended Willems clan who has close ties to Waldheim. Keith had found my earlier family history website and was wondering if I would be interested in the research he had done on the family. I responded with an immediate Yes. The Homestead Application Certificate in the photo below was part of the packet he sent. 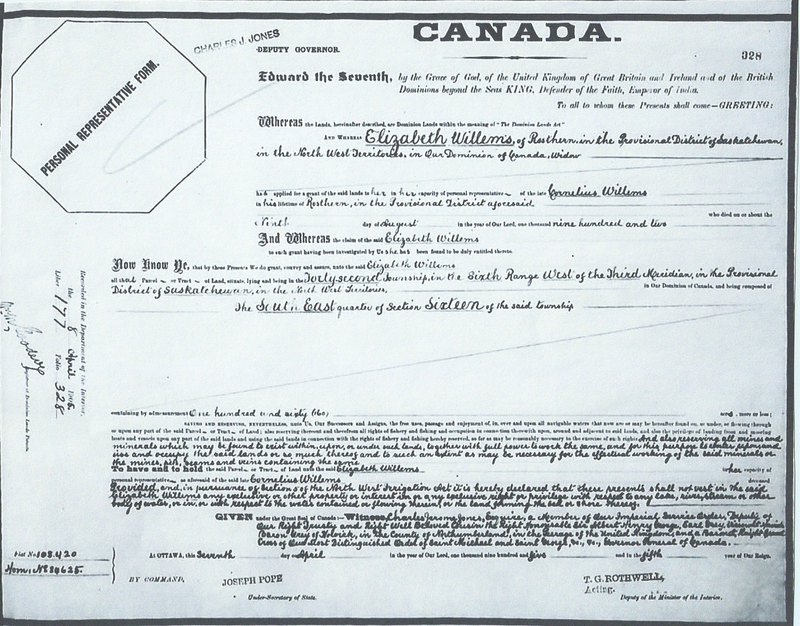 The photocopy is hard to read, but by using a magnifying glass I could read that the application was filed by Elizabeth Willems, the “heir” of “the late Cornelius Willems” who died on the ninth of August “in the year of Our Lord, one thousand nine hundred and two.” The certificate conveys to Elizabeth the claim made by her deceased husband Cornelius Willems on the South East quarter of Section Sixteen in the Forty-second Township in the Sixth Range West of the Third Meridian, in the Provisional District of Saskatchewan in the North West Territories. The certificate is dated 8 April 1905, which means that Elisabeth filed her claim at almost the same time that my great-grandfather Heinrich Zimmermann was writing his letter to the Zionsbote informing its readers about the death of his wife, Maria. One year later, on 18 March 1906, the widowed Heinrich H. Zimmermann married the widowed Elisabeth Boldt Willems. Heinrich was 39 years old; Elisabeth was 46. That Elisabeth was seven years older than her husband would not have seemed strange to them or their community. Marriages in which the woman was older than the man were common among Mennonites. That was especially the case where the woman was a widow who owned land and the man didn’t as was the case in the marriage between Heinrich and Elisabeth. Each gained by that marriage. Heinrich got a farm and home for his children; Elisabeth acquired a husband seven years younger than she, a valuable asset for a land-owning widow. Elisabeth had two grown sons to help her, but they needed to acquire their own land, marry and begin their own families. The documents in the packet Keith Kroeker sent included photocopies of homestead application certificates for Jacob Willems dated 14 April 1905 and for Cornelius C. Willems dated 23 June 1905. Given the place of residence, Jacob is almost certainly my grandfather and Cornelius, his older brother. Jacob filed his claim just six days after Elizabeth. Cornelius filed his two months later. However, the two brothers seem not to have immediately moved out of their mother’s house. The 1906 Census for the Province Saskatchewan, District 16, Sub-district 17, includes the name Heinrich Zimmermann as head of a household that includes Elisabeth, his wife, and the names of nine children with the last name of what looks like a mangled spelling of Willems followed by five children with Zimmerman as the last name. The names are given in age-descending order. The Willems list begins with the name Cornelius age 24, followed by Jacob age 22. The seven names that follow match those of Elisabeth’s other children—five girls and two boys—with ages ranging from 20 down to 6. The Zimmermann list begins with the name Lena, my grandmother’s name, age 13, followed by four more names—two girls and two boys—the youngest of whom is 6. The date of the entry for this household is July 17, 1906. The location of the household is the same as that given on Elisabeth’s Homestead Certificate—Section 16; Township 42; Range 6; 3rd Meridian. The entry also includes information on the household livestock—15 horses; 6 milk cows; 6 “other horned cattle”; 6 hogs. Sixteen people lived on that farm. I wonder what kind of house Elisabeth had managed to provide for her family. I hope it was a big one, one like those I’ve seen in some Waldheim photos from that period. 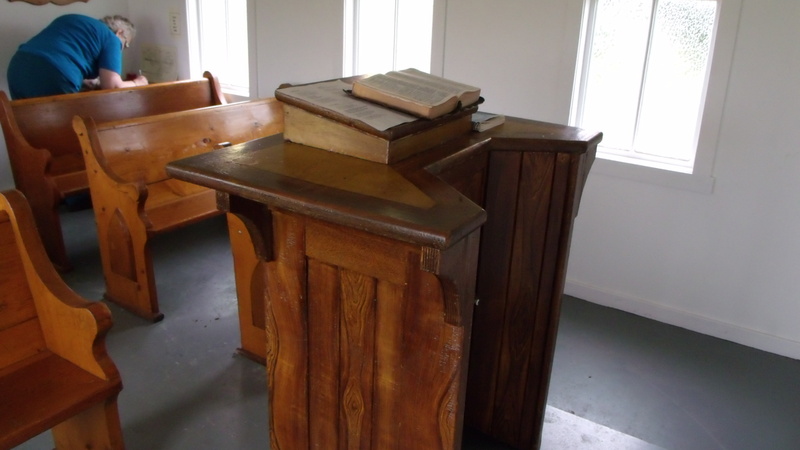 [i] The photos of the pulpit were taken by Dennis Zimmerman who lives in Winkler, Manitoba. He is another great-grandchild of Heinrich H. Zimmermann. HHZ’s son Henry (1895-1977) was Dennis’ beloved grandfather. [ii] Reinhild Kauenhoven. Mennonite Furniture: A Migrant Tradition: 1766-1910. (Janzen & John M. Janzen, Good Books, 1991), 183-184. [iii] J. A. Toews. A History of the Mennonite Brethren Church: Pilgrims and Pioneers. (Hillsboro, KS: Mennonite Brethren Publishing House,1975), 304-205. [iv] The David Dyck letter was translated by Dora Dueck and is included in her published MA thesis: Print, Text, Community: A Study of Communication in the Zionsbote, A Mennonite Weekly, Between 1884 and 1904 (The Universities of Manitoba and Winnipeg, Winnipeg, Canada: National Library of Canada, 2001) 49-51. [v] In1906, the year Heinrich and Elisabeth were married, David Dyck moved to Saskatchewan, where he took up a homestead in Borden, which is on the north side of the North Saskatchewan River about 25 miles from Waldheim. In 1910 he bought a farm near Waldheim and became the lead pastor of the Brotherfield church. “He also traveled extensively and preached frequently to Russian congregations. He served as moderator of the Northern District (Canadian) Conference on thirteen occasions, and also represented the brotherhood on the Board of foreign missions” (Toews, 158). [vi] Heinrich was definitely an ordained Prediger, but when he was ordained, I don’t know. The obituary my great-grandmother Elisabeth wrote when Heinrich died states that “he was called by the community to work in the realm of God” soon after his conversion. The Yearbooks for the Saskatchewan Mennonite Brethren Conference lists him as Prediger (preacher) for the years 1914 – 1918. The Saskatchewan Yearbooks do not use the designation, “ordained,” after any of the church leaders. However, the Zimmermann’s moved to California in the 1920s, and the Yearbooks for the Pacific District Conference of Mennonite Brethren Churches, do note whether church leaders ordained, and Heinrich is listed as Ordinieter Prediger (Ordained Preacher) at the South Reedley Mennonite Brethren Church (which became the Dinuba M.B. Church in 1936). [vii] The photo of the church is from the unpublished family history written by Norman W. Janzen: A Good Land: The History of the Abraham S. Willems Family in Canada 1899-1999. The research here is quite impressive! I have to thank a lot of people for that research. I’m deeply grateful for their generosity.